Astute readers may have gotten the impression that I’m not having the time of my life this week. Unfortunately, that’s sort of true. It’s has absolutely nothing to do with the class itself. Patrick, His wife Kirsten and his partner Patrice are all amazing. Unfortunately there are some changes going on at work that are deeply troubling and (apparently) couldn’t wait until I was back. That, combined with my own frustrations at not being able to do a better job on the projects, have sort of cast a pall over the experience for me. But I’m sticking with it, and I’ll figure out the bits that have been frustrating me when I get back. Today I started out by finishing sawing out the rest of the third project. This one was really tough, and my sawing is a mess. It’s probably not obvious looking at the pictures, but the parts are really inconsistent. 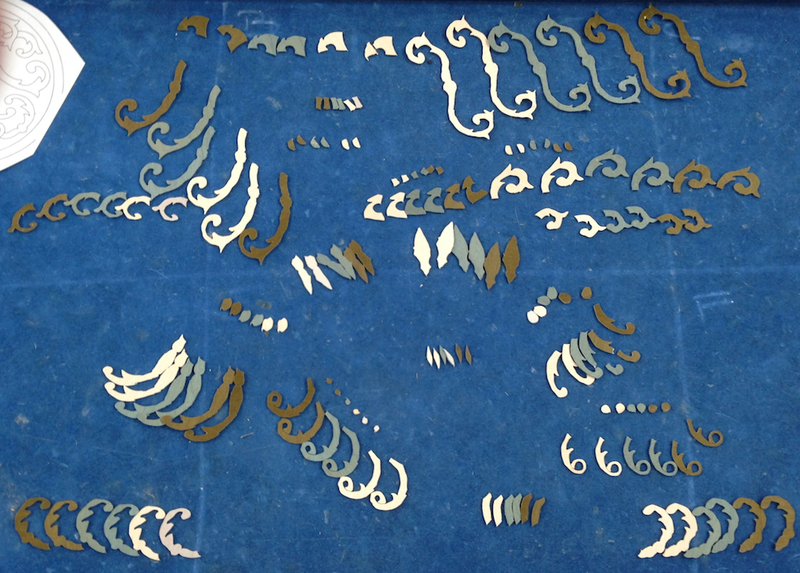 Parts from sawing the final project. It’s not obvious, but the shapes are really inconsistent. Where parts should be mirror images from side to side they aren’t. In places they are sawed accurately, but overall it stinks. Oh well. We started assembling the six coasters that will result from this packet, I got three assembled and needed to stop. It’s really hard to keep the parts straight, and intermix the colors properly. I’ll finish this tomorrow, including making a couple of repair pieces that went AWOL. The other activity was to fill in the saw kerf gaps with “mastic”. We mixed a tiny bit of hot water, a swirl of hot hide glue and enough fine wood dust to make something the consistency of cake frosting. (remember, this is the bace we’re looking at here) This is worked into the gaps and allowed to dry. 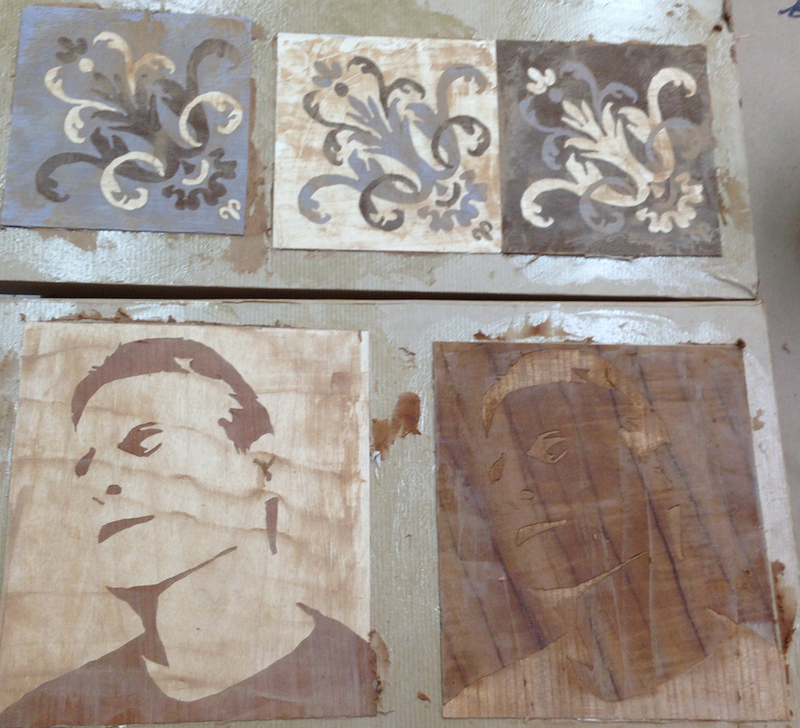 Any lumps are sanded off the surface, then the pictures are cut free from the assembly board and laminated face up on plywood to make the finished part. We’ll have to scrape off the kraft paper and apply some finish tomorrow too. Sounds like it will be a busy day. 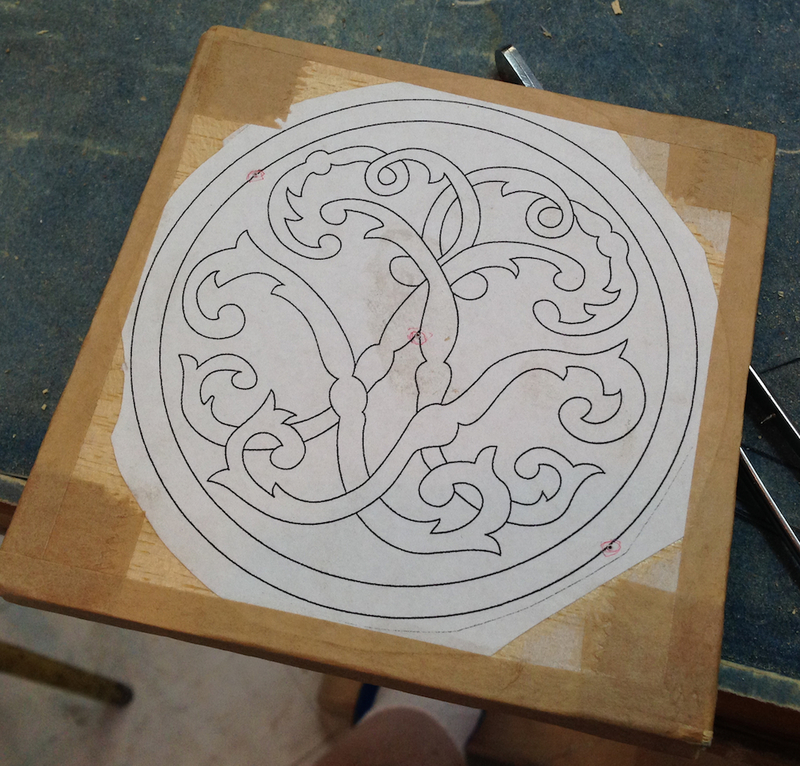 This is the first project we did, a set of three corner details from a Boulle cabinet. This is the backside, before the mastic was worked into the seams. First project glued to the backing board, face down, waiting for mastic. I’m impressed with day four. Did anything get flying lessons yesterday? Unfortunately those little bit of veneer don’t have enough mass to throw very far. I’m betting once I get them turned into mini-frisbees it will be a different story.